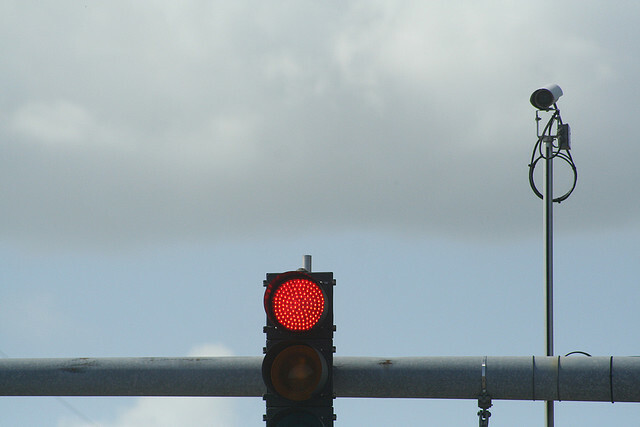 How risky is it to privatize red-light traffic cameras? Photo by sylvar. Research out of Lund University in Sweden found a relationship between car driving and negative health. The study uses public health surveys from 2004 and 2008 to show that the mode of commuting can have an effect on sleep quality, everyday stress, vitality, mental health, physical health and work productivity. With a final study population of 21,088 people, the study found that car commutes of 30 minutes to 60 minutes have increased health complaints and commutes longer than 60 minutes have a similar negative relationship to health despite the mode of transport. The study suggests that the negative side effects of long commutes should be considered when discussing policies aimed at increasing mobility of the workforce and makes a strong case for commuting by biking or walking. Download the full study here. U.S. Public Interest Research Group released a report on the risks of privatizing traffic law enforcements, specifically red-light traffic cameras. The report asserts that contracts between cities and private, for-profit vendors that provide traffic law enforcement services can sometimes put profits above traffic safety. The study finds that problematic contracts require cities to share their revenue with the vendor on a per-ticket basis. Basically, the more tickets a camera system issues, the more profit the vendor collects. The report finds that certain contracts between cities and camera vendors can include penalties for early termination. In other words, if the program fails, taxpayers are still responsible for covering the costs of such a program. Furthermore, the privatized traffic law enforcement industry has garnered enough significant political endorsement that it shapes traffic safety nationwide. Read more of the report here. A study by the Florida Department of Transportation looking at the road behavior of car and truck drivers found that motorists give more passing room to cyclists when they are 3 feet to 4 feet from the curb. The study found that the average of 5.5 feet motorists give in lateral separation can decrease based on factors of volume of motor vehicles, type of motor vehicle, and surprisingly, the gender of the bicyclists. The study explains that motorists provided an additional 0.5 feet in lateral separation to female bicyclists and 0.35 feet to causally dressed compared to athletically dressed cyclists. Read more here.